Reading and share top 6 famous quotes and sayings about Looking Down Upon by famous authors and people. Browse top 6 famous quotes and sayings about Looking Down Upon by most favorite authors. 1. "I believed, from the solitary and thoughtful way in which my mother murmured her song, that she was alone. And I went softly into the room. She was sitting by the fire, suckling an infant, whose tiny hand she held against her neck. Her eyes were looking down upon its face, and she sat singing to it. I was so far right, that she had no other companion. I spoke to her, and she started, and cried out. 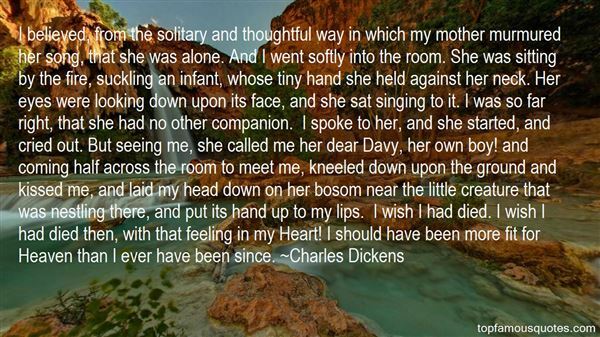 But seeing me, she called me her dear Davy, her own boy! and coming half across the room to meet me, kneeled down upon the ground and kissed me, and laid my head down on her bosom near the little creature that was nestling there, and put its hand up to my lips. I wish I had died. I wish I had died then, with that feeling in my Heart! I should have been more fit for Heaven than I ever have been since." 2. "Gazing around, looking up at the lofty pinnacles above, which seemed to pierce the sky, looking down upon the world,--it seemed the whole world, so limitless it stretched away at her feet,--feeling that infinite unspeakable sense of nearness to Heaven, remoteness from earth which comes only on mountain heights, she drew in a long breath of delight, and cried: "At last! at last, Alessandro! Here we are safe! This is freedom! This is joy!" 3. "A man in a topiary maze cannot judge of the twistings and turnings, and which avenue might lead him to the heart; while one who stands above, on some pleasant prospect, looking down upon the labyrinth, is reduced to watching the bewildered circumnavigations of the tiny victim through obvious coils - as the gods, perhaps, looked down on besieged and blood-sprayed Troy from the safety of their couches, and thought mortals weak and foolish while they themselves reclined in comfort, and had only to snap to call Ganymade to theeir side with nectar decanted.So I, now, with the vantage of my years, am sensible of my foolishness, my blindness, as a child. I cannot think of my blunders without a shriveling of the inward parts - not merely the disiccation attendant on shame, but also the aggravation of remorse that I did not demand explanation, that I did not sooner take my mother by the hand, and-I do not know what I regret. I sit with my pen, and cannot find an end to that sentence." 4. 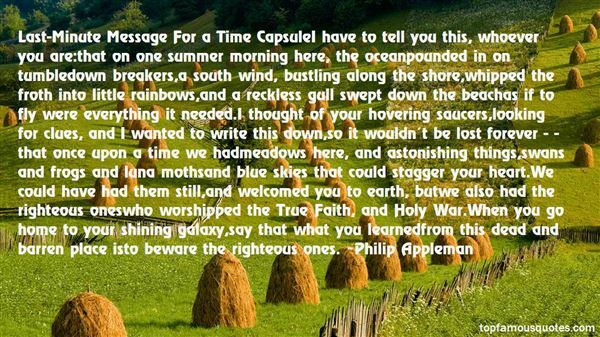 "Last-Minute Message For a Time CapsuleI have to tell you this, whoever you are:that on one summer morning here, the oceanpounded in on tumbledown breakers,a south wind, bustling along the shore,whipped the froth into little rainbows,and a reckless gull swept down the beachas if to fly were everything it needed.I thought of your hovering saucers,looking for clues, and I wanted to write this down,so it wouldn't be lost forever - -that once upon a time we hadmeadows here, and astonishing things,swans and frogs and luna mothsand blue skies that could stagger your heart.We could have had them still,and welcomed you to earth, butwe also had the righteous oneswho worshipped the True Faith, and Holy War.When you go home to your shining galaxy,say that what you learnedfrom this dead and barren place isto beware the righteous ones." 5. "[My grandfather] returned to what he called ‘studying.' He sat looking down at his lap, his left hand idle on the chair arm, his right scratching his head, his white hair gleaming in the lamplight. I knew that when he was studying he was thinking, but I did not know what about. Now I have aged into knowledge of what he thought about. He thought of his strength and endurance when he was young, his merriment and joy, and how his life's burdens had then grown upon him. He thought of that arc of country that centered upon Port William as he first had known it in the years just after the Civil War, and as it had changed, and as it had become; and how all that time, which would have seemed almost forever when he was a boy, now seemed hardly anytime at all. He thought of the people he remembered, now dead, and of those who had come and gone before his knowledge, and of those who would come after, and of his own place in that long procession." 6. "For a long while we just stood there, looking down at the profound and fleshless grin. The body had apparently once lain in the attitude of an embrace, but now the long sleep that outlasts love, that conquers even the grimace of love, had cuckolded him. 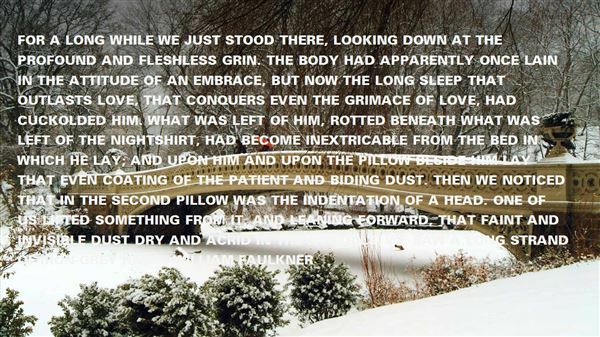 What was left of him, rotted beneath what was left of the nightshirt, had become inextricable from the bed in which he lay; and upon him and upon the pillow beside him lay that even coating of the patient and biding dust. Then we noticed that in the second pillow was the indentation of a head. One of us lifted something from it, and leaning forward, that faint and invisible dust dry and acrid in the nostrils, we saw a long strand of iron-grey hair."